These orchids are prized for their long-lasting sprays of flowers, used especially as cut flowers or for corsages in the spring. 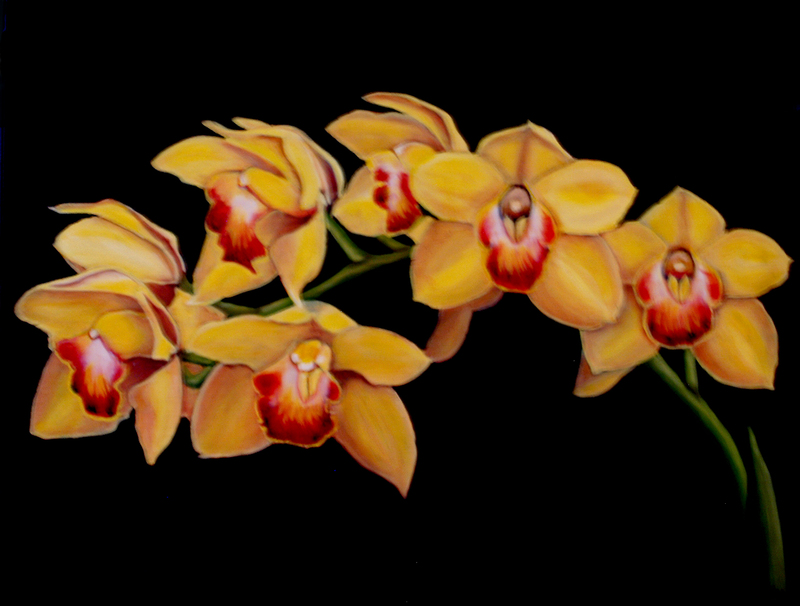 There are two main types of cymbidiums – standards and miniatures. Where summer nights are warm (above 70 F), only miniatures can be recommended, because manyare more tolerant of heat and able to flower in warmer weather. Light is important for growing cymbidiums. Coming from cool and bright areas in Asia, they need high light but cool temperatures. In many southern climates, high summer temperatures, especially at night, may prevent the plants from blooming. The maximum amount of light possible, short of burning, should be given to the plants. This means only light shade during the middle of the day, or about 20 percent shade. In cool areas (such as coastal California), full sun is tolerated. Leaves should be a medium to golden green in color, not dark green. Temperatures are another critical factor in flowering standard and miniature cymbidiums. During the summer, standard cymbidiums are usually grown outside in semishade, where day temperatures should be 75 to 85 F (or more), but night temperatures in the late summer to autumn (August to October) must be 50 to 60 F to initiate flower spikes. Optimum temperatures in winter are 45 to 55 F at night and 65 to 75 F during the day. When plants are in bud, temperatures must be as constant as possible, between 55 and 75 F. Miniatures can stand temperatures five to 10 degrees higher than standards and still flower. Most cymbidiums can tolerate light frosts and survive, but this is not recommended. Bring them inside when temperatures dip to 40 F. In mild climates, they can be grown outside year round. A bright and cool location inside is best for winter months. Water to provide a constant supply of moisture to cymbidiums, which are semiterrestrial plants. They generally produce all their vegetative growth during the spring and summer and need the most water during that period. Water heavily during the growth season, keeping the potting material evenly moist. Reduce water when the pseudobulbs complete growing in late summer. Keep barely moist during the winter. Humidity outdoors is usually sufficient during the summer, except in dry climates, where evaporative cooling in a greenhouse is necessary. Keep humidity at 40 to 60 percent during the winter, especially if plants are in bud. Keep the air moving to prevent fungus (Botrytis) from spotting the flowers. 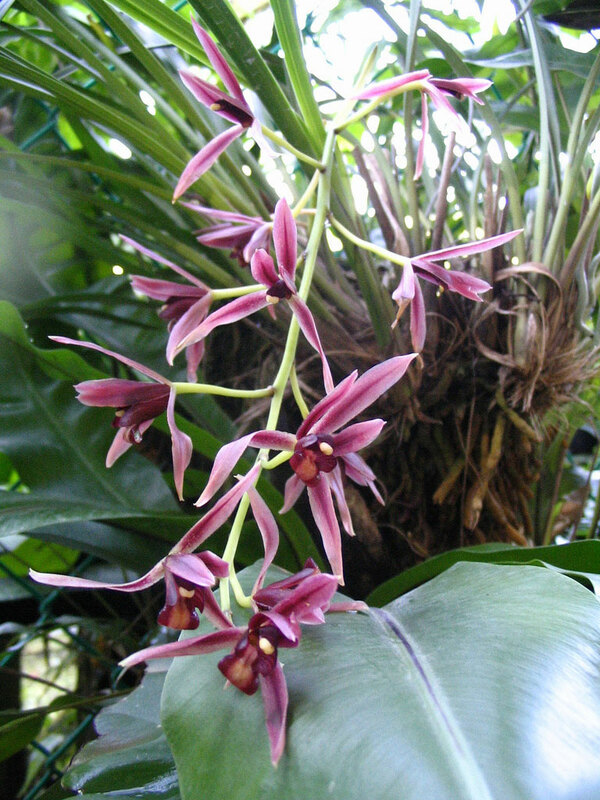 Fertilizer at the proper time to help cymbidiums flower. During the growth season (spring through late summer), highnitrogen fertilizer (such as 30-10-10) is used. In late summer, use a high-phosphorus, blossom-booster fertilizer (such as 10- 30-20), to help form bloom spikes. Fertilize at full strength every week to two weeks. In winter, fertilize once a month. Potting is usually done in the spring after flowering, usually every two years or when the potting medium decomposes. Shake all of the old potting mix off the roots, dividing the plant if desired. Pick a water-retentive potting mix; medium-grade fir bark with peat moss and perlite is a common mix. Select a pot that will allow for at least two to three years of pseudobulb growth before crowding the pot, while planning on placing the active growing pseudobulb(s) of the division farthest from the side of the pot. Spread the roots over a cone of the mix in the bottom of the pot and fill the container with medium, working it among the roots, tamping firmly. Single backbulbs need not even be placed in mix until new growth and roots are noted. Keep shaded and warm until new growth sprouts, and pot as above.